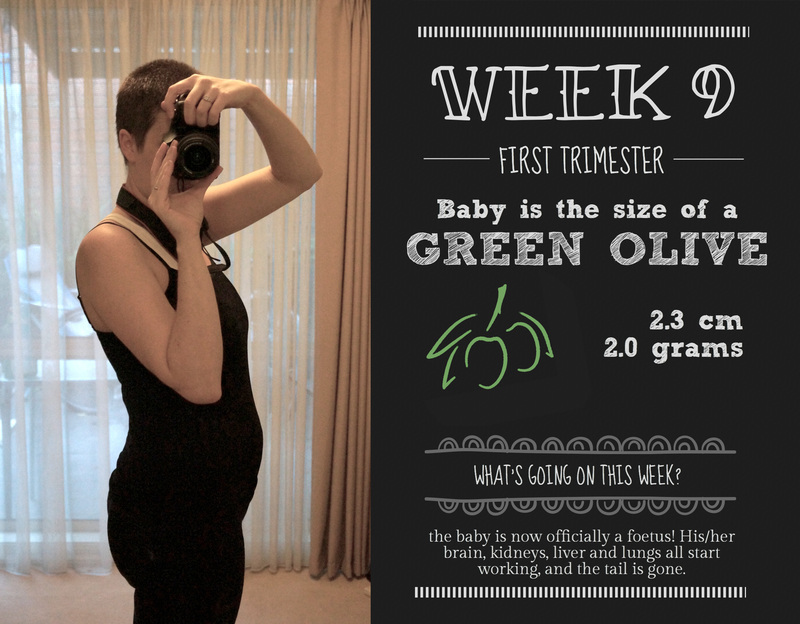 Baby: A green olive. We’re getting into proper food related references now, and it’s a little alarming at how quickly they seem to be increasing in scale. Each week, the length and weight almost double, which seems crazy. I know I’m bulking up a bit, but I’m very glad I’m not doubling in size! What I’m cooking: All those organs that have been growing over the last couple of weeks start working, including the brain. And while the fingers and toes are still webbed, my little olive no longer has a tail! Phew! No lizard baby for me. Main symptom: HUNGER. I am constantly starving. I will eat my own weight in food, feel ok (still not full), then two hours later I am suddenly ravenous again! Thankfully the scales are yet to show much difference (I’m up a total of 0.7kg since we found out), so I must be needing this ridiculous increase in energy requirements! What’s on this week: Business as usual. Counting down until next week when it all happens though – 11 week scan and the official announcing to all and sundry! As you can see from my progress photo, we’re heading towards bump city. I’m pretty sure a fair whack of that is still bloat (as evidenced by my inability to, erm, digest regularly, and my ever strengthening ability to let nothing but loud clouds of air through…I’m gorgeous, right?). I do feel more like there is something happening though – my stomach is much firmer, and the bump seems to start much lower than where my fat usually kicks in. I seem to be curving outwards from below the undie line, which makes me think that maybe this is the real thing. Also, as you’ll again notice from my update pick, the old milk jugs are changing in appearance. They’ve grown quite substantially, although the photo doesn’t show it. The main reason for this is that I’ve sworn off anything containing an underwire, so I’m basically living in sports-bra style crop tops. And by living in, I mean living in. The only time those babies come off is at shower time. So now instead of lovely perky ones, mine are smooshed into a uniboob, which pales in comparison to my expanding stomach. Despite the related symptoms I’m still getting (tired, moody, seriously hungry, scatterbrained), most days I struggle to believe I’m pregnant. There’s only a teeny bump coming on at the moment, and still no sign of the dreaded morning sickness (I have been nauseous/queasy on occasion, and every now and then I’ll dry retch in the shower…oh yeah…). I end up with an ongoing combined feeling of luck at not heaving my guts up, and terror that it must mean something is wrong. In terms of the likelihood of getting morning sickness, the stats say around 75-80% will experience it. They do however class morning sickness as nausea, and/or vomiting. Not necessarily both. So I guess I have had it to some extent, but not enough to write home about (just enough to blag on endlessly to you! Lucky!). So that’s me for now. Still keeping all of this a secret (although every time Mum calls I almost spill the beans), and still hoping against hope that all is going OK in there. Now if you’ll excuse me, I’m off to eat an entire horse. Well cooked, of course. You’re gorgeous, first off. I love all stages of the cute pregnant bellies! I totally am feeling you on the nausea. I didn’t have it with my first (no vomiting, just queasiness and food aversions), and I kinda hope it’s the same again, BUT it would be a huge comfort to be sick. I can’t believe you’ve been able to keep it a secret from your mom this long! Your posts always crack me up! I feel the same way as you.. wavering between excited I’m not constantly barfing and feeling terrified that something terrible has happened. You are not alone! Thank you!! Just hanging for the scan next week to see everything’s ok, then hopefully I can relax for a while!